Whether you’re just learning to surf or a seasoned pro, yoga is a wonderful way to complement your passion. And you don’t need to be an expert yogini to reap the benefits! For nearly 10 years, I’ve taught yoga to surfistas at Las Olas surfing for women, so I’ve seen how just a few simple yoga moves can help improve flexibility, prevent injuries, increase balance, develop breath control, and restore muscles essential for surfing. Like most surfers, you’re probably itching to skip the stretch and dive right into the waves, but if you spend just a few minutes practicing these seven simple yoga moves before and after your surf session, your body will thank you! Or as I like to call it, the Beyonce. This is a great way to warm up your spine and hip flexors for surfing. Start on all fours in a table top position with your knees under your hips and hands under your shoulders. Spread your fingers wide like little starfish. Spend a couple minutes rounding your spine and lifting your tailbone on your exhale, then opening your chest when you inhale. (Feel free to get funky with it!) Tap into your breath and move in any way that feels good. Flexion and extension, side to side, or circles. Explore all the different ways your spine can move. So yummy! Since we spend much of our time in this posture while paddling, it’s a good idea to practice cobra postures on land to warm up your spine before heading out. This can actually improve your paddling positioning and technique on your board. Start by lying on the ground, belly down and legs hip distance apart. Anchor through the tops of your feet, pubic bone, and hips before you inhale, then lengthen and lift your chest off the ground or surfboard. Do this as a dynamic movement, inhaling as you rise up into cobra and exhaling as you descend. Balance is an important part of surfing. 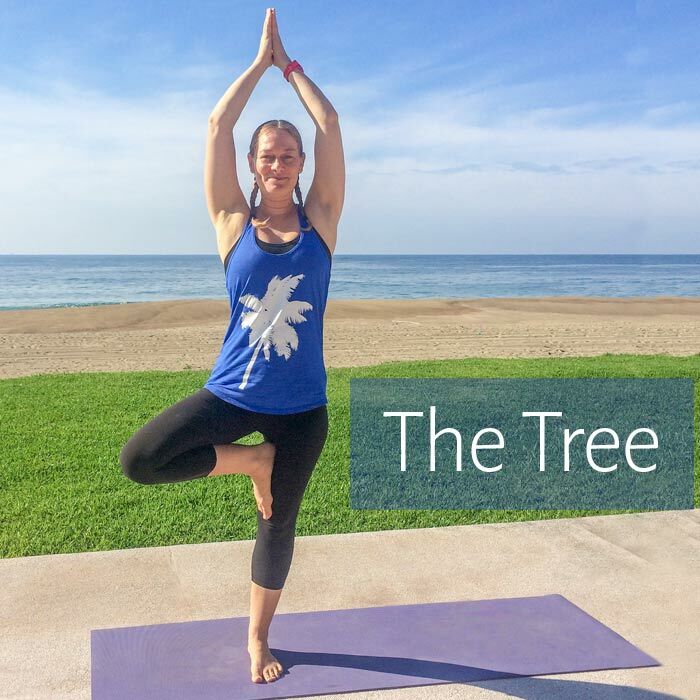 Practicing the Tree Pose will not only improve your steadiness and focus, but also help open your hips to prepare for those graceful pop-ups. Start by standing with your feet hip distance apart, weight distributed evenly over both feet. Look straight ahead and focus on something to help you balance. Shift your weight onto your right foot. Bend your left knee and open your left hip. Depending on your flexibility, you can rest your left foot on either your right ankle (easiest), calf (more challenging), or inner right thigh (most challenging). Hold as long as feels comfortable while breathing calmly. Come back to the starting position. Close your eyes, take a couple deep breaths, and repeat on the opposite leg. Notice the difference? This is a fantastic pose for stretching all those tired paddling muscles. It also feels great for the hips after straddling your board. Start by standing with legs hip width apart. Cross your right foot over your left foot and glue your inner thighs together. Cross right arm under left arm and either give yourself a big hug or wrap your forearms so your palms touch. Take this pose further by pretending to sit in an imaginary chair with your legs still crossed. Plant your top foot on the ground for balance or challenge yourself by lifting it behind your other calf. For a deeper sensation, lift your elbows up and away from your body. Repeat on the opposite side. I love practicing just the arm portion of this pose while sitting on my surfboard after a challenging paddle. To relieve those sore paddling muscles and soothe lower back tightness, the Shark Fin offers a nice little tricep stretch. Come into Child’s Pose with knees nice and wide to create space for your body to settle towards the earth. 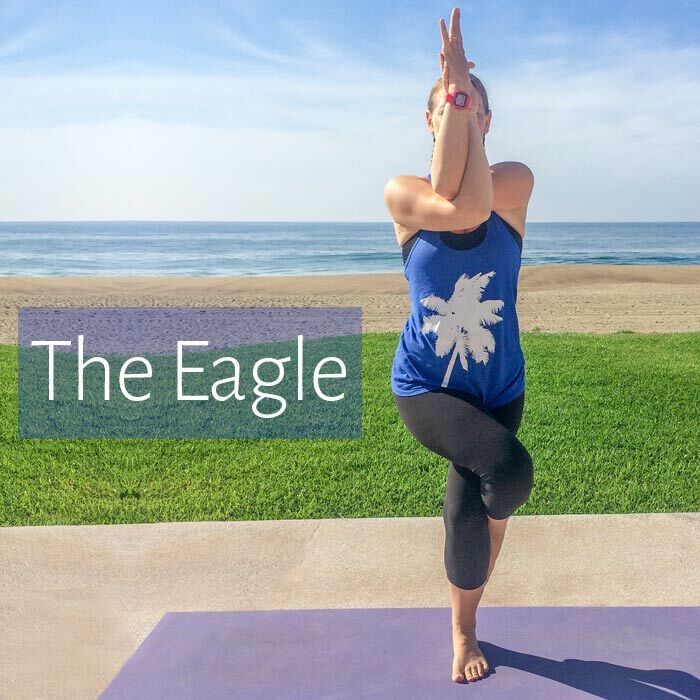 Lengthen your arms along the ground towards the top of your mat, bringing palms together. Bend your elbows, bringing your hands towards the back of your head and enjoy the sensation in your triceps and down the sides of your body. To intensify that yummy goodness, try walking your elbows forward and let your heart melt a little deeper to the mat. Aaahhh. This pose is juicy for hips and spine. It targets those tight spots we get in the neck and between the shoulder blades after surfing, so it’s head-to-toe deliciousness. Sit on the ground and put the bottoms of your feet together. Cross your right arm under your left arm and hold your knees, shins, or thighs. Exhale deeply and round your spine from your tailbone to the crown of your head, letting your knees fall open with gravity. You’ll enjoy a warm sensation in between your shoulder blades as your head relaxes while your knees are open. Enjoy other sweet spots by moving your head side-to-side. Hold that position while breathing calmly, then slowly release and repeat on your opposite side. Visualization is an important technique to improve your surfing, so why not mind surf whenever you can? Take breaks throughout your day to imagine that you’re paddling, popping up, and riding waves. Get creative and have fun with it! Visualize making the drop, popping-up fluidly, paddling with strength and ease, feeling the sea breeze hitting that huge smile on your face, and maybe even dismounting with grace and style! Safety note: I don’t recommend mind surfing during any activity that requires your full attention like driving a car, unless you’re sitting in traffic! Then by all means–mind surf away! I hope you find a few minutes each day to sneak yoga into your life. About the author: As a young girl, Aynsley’s mom introduced her to yoga to help “focus her energy”. That began her life-long interest in the practice and she eventually became a gifted teacher. Since 2008, she’s been Head Surfcoach at Las Olas Surfing for Women where she’s taught yoga to both seasoned surfers and first-ever wave riders. Originally from Canada, Aynsley now lives in southern Mexico with her family.